Most people would not have survived this, but ?????? 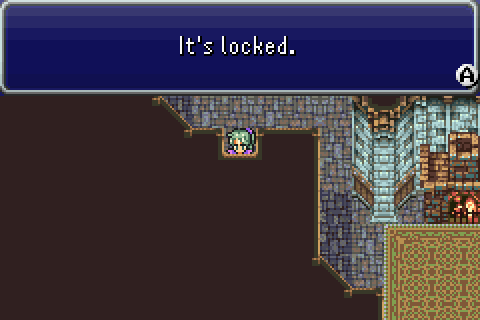 is an RPG protagonist with a portrait and everything, and needs only fear cutscene death once she has established herself as likeable and sympathetic. Or potentially un-likeable and pathetic, depending. 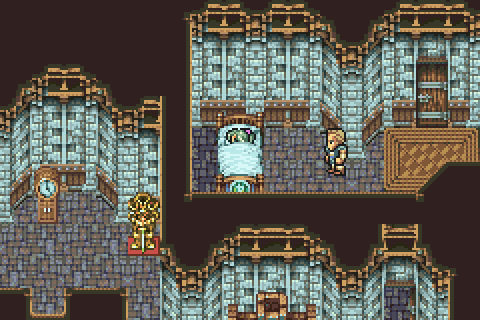 She wakes up in a bed, just in time to catch this guy staring at her. If you don't expect to regain control here, it can lead to an uncomfortably long moment of "old man staring at unconscious teenage girl". 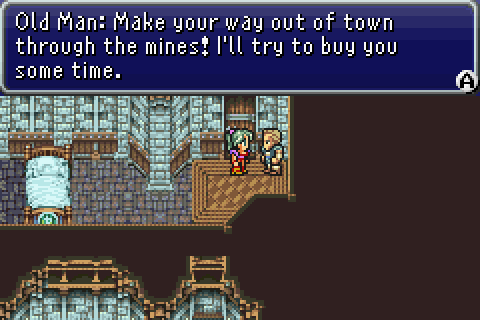 ...unfortunately, that plan doesn't really pan out. 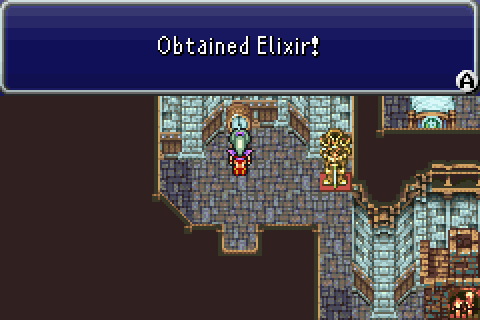 Elixirs are among the best healing items in the game, fully restoring one character's HP and MP. Clocks, for reasons known only to the game developers, are your primary source of these things. 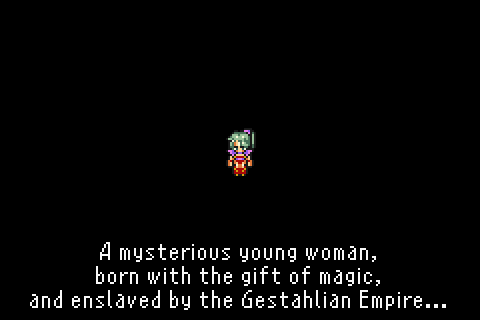 This one is probably going to sit in my inventory through the entire game because, you know, what if the next boss is even more powerful? All exits barred, loot obtained, we have little choice but to talk to the creepy old man. Fun fact: even if you talk to him from behind, ?????? 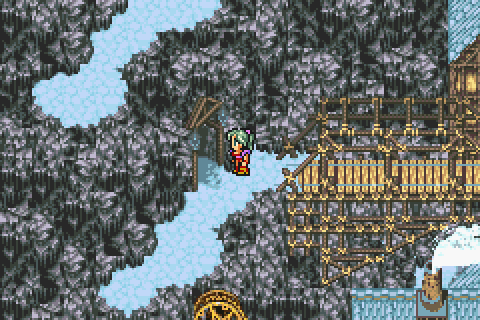 (or "Girl", as the game refers to her in conversation) will walk around him so they can get into this position. My, my! And I just removed the crown! The old man walks over to the right and fiddles with something in the corner. It was robbing you of your thoughts - making it so you'd do whatever they told you. Don't worry. 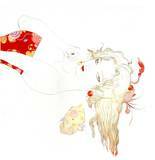 It'll all come back to you... In time, that is. 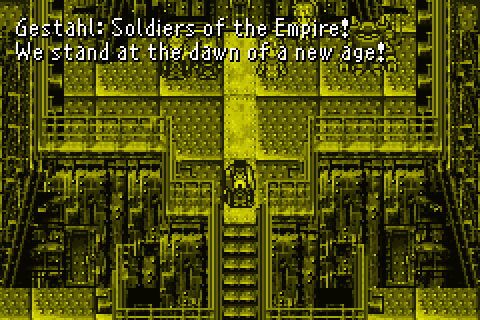 The game lets you name all major party members, but not before it gives you a brief introduction. 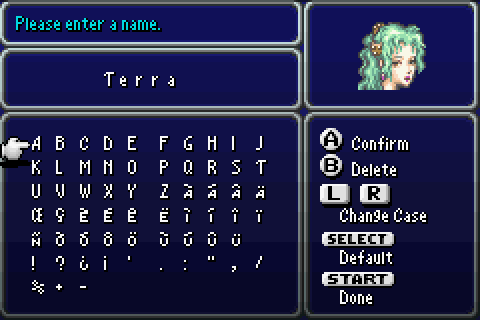 I thought of a proper name for a green-haired amnesiac girl with mysterious powers, but alas, the game does not provide enough space. However, I rather like the Latin theme in the Woolsey translation, so we'll just stick with that. 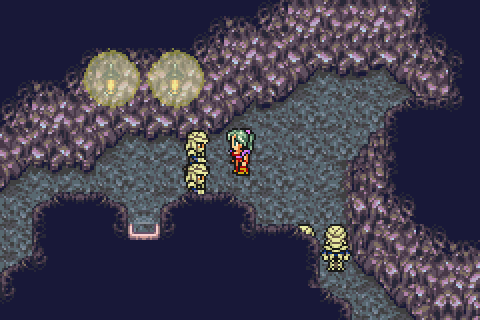 I think one of the creepiest things here (and FFVI contains some very creepy things indeed) is that these things are apparently not uncommon. Though it's just mentioned in passing here, if you stop to think about it, it really doesn't paint the Empire in a positive light. 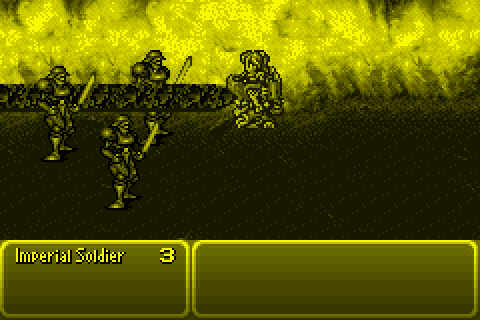 At this point, the scene cuts to outside, and a couple of soldiers run up and bang on the door. 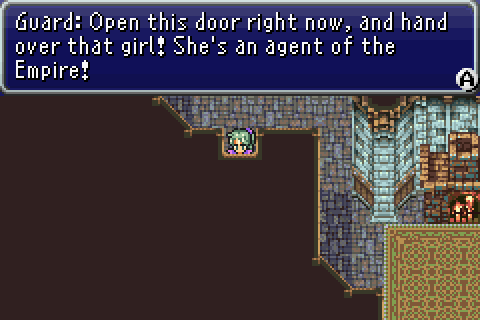 Open this door right now, and hand over that girl! She's an agent of the Empire! Agent of the Empire sounds kind of like a Star Wars novel. Still, I can't imagine they have anything pleasant in store for us. He runs off towards the back door. Surrendering peacefully isn't an option, so we'll take him up on that offer. ...to what's probably the most exposed location in town. 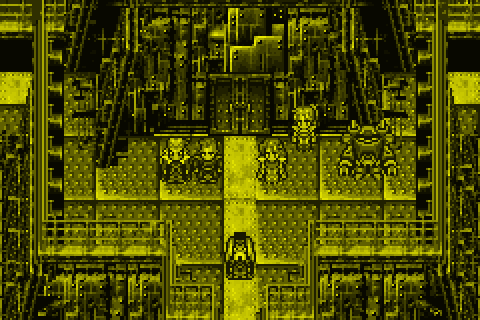 Honestly, if these guys are the same ones we fought in the last episode (well, not the same ones, because we killed those, but you know what I mean), Aeris could probably mop these guys up all by her lonesome without breaking a sweat, and not just because she's wearing a swimsuit in the goddamn Arctic or something. 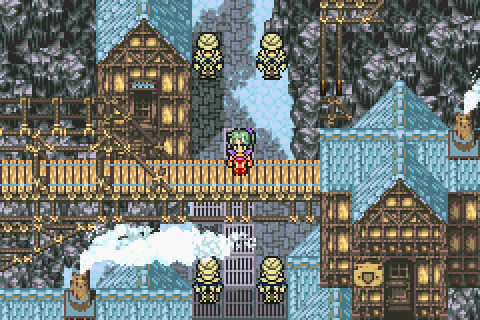 But these trained soldiers and their attack dogs have to make it through the harmless old man back in the house where she woke up before they can get to her, so we should be safe. 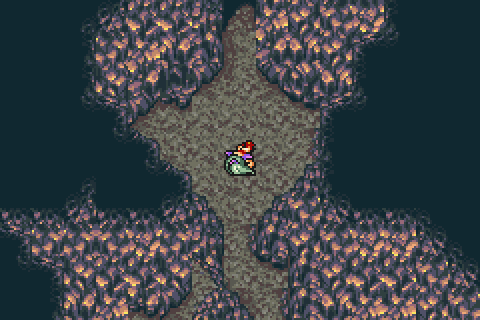 These caves are just a different part of the ones where we fought Ymir, and the encounters are much the same. 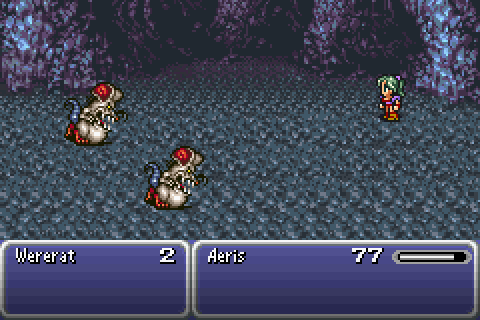 Even without her giant mech, Aeris is quite capable of dealing with these creatures. 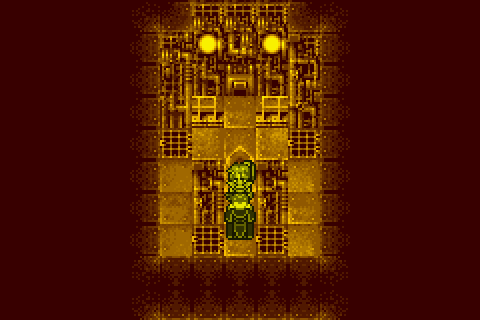 On foot, the Magitek command has been replaced by Attack, which is self-explanatory. 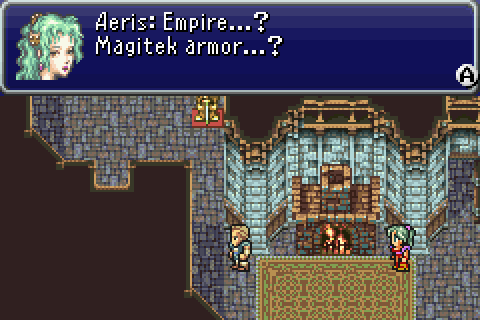 Aeris had access to the Magic command from the beginning, but it's strictly inferior to the magitek powers, so there wasn't much point in using it. Presently, all she knows are the basic Fire (elemental attack) and Cure (HP recovery) spells, but they are more than sufficient for now. 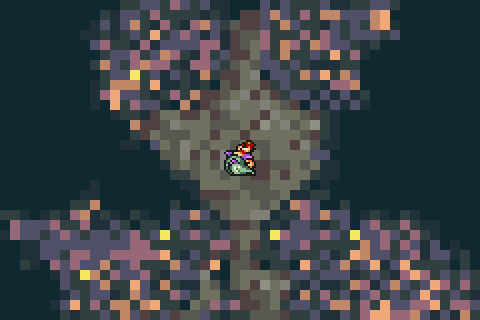 Many spells can be aimed at a single character or spread out among several targets. 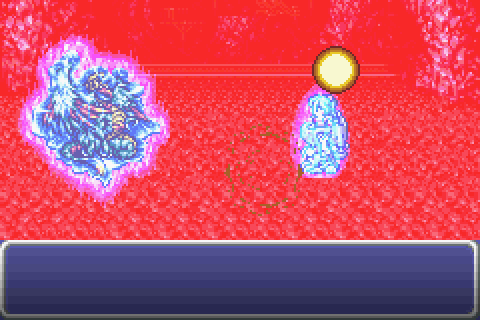 Doing so reduces the effect, but even then, it's enough to kill both of these in one shot. 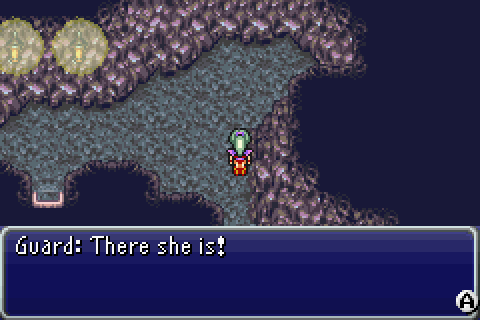 She obtains a potion for her efforts. This is a good time to look through her inventory. 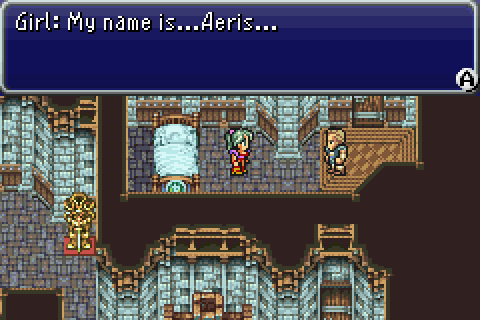 Potions are your basic HP restoratives and they are already outclassed by the heal spell Aeris starts with. This is our reward for killing Ymir's head. 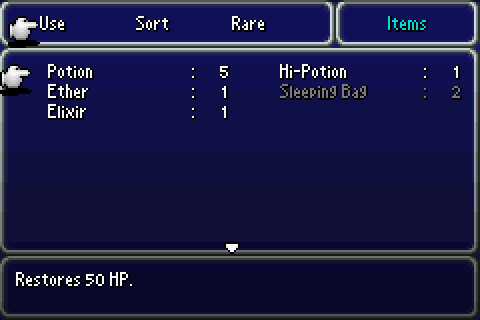 Hi-Potions will be useful for a good chunk of the game. The reward for the shell. Not really worth the effort of hacking through Ymir's 50000 hit points for this, but it's nice to have now that we're done. The elixir will be gathering dust for a long time. 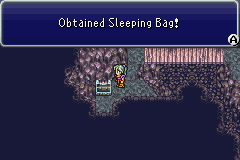 We also have two sleeping bags, which I guess means Biggs and Wedge were sharing one of them. 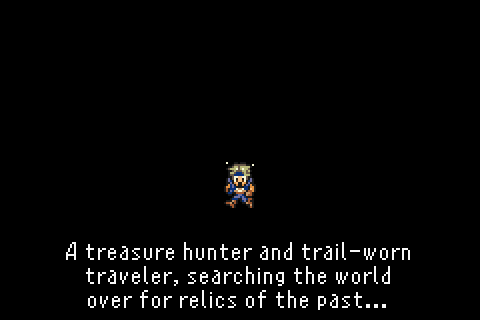 In the game, though, they're one-use items. ...finding our first treasure chests! 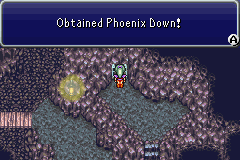 Phoenix Down is your basic resurrection item and restores a small amount of HP to a character who has been reduced to 0. 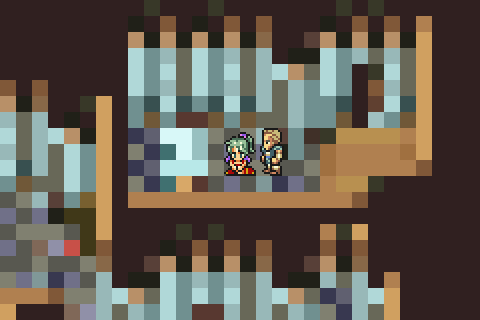 However, Aeris has enough sleeping bags and she can't phoenix down herself if she's dead, so she puts them back. All part of my cunning plan, which happens to also involve turnips. 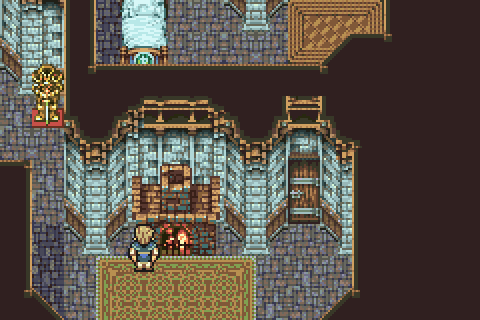 We don't get to see much of this dungeon on the first visit. Just a few screens in, the guards catch up, which I suppose means our anonymous benefactor got mauled by the rabid wolves these guys keep as pets. 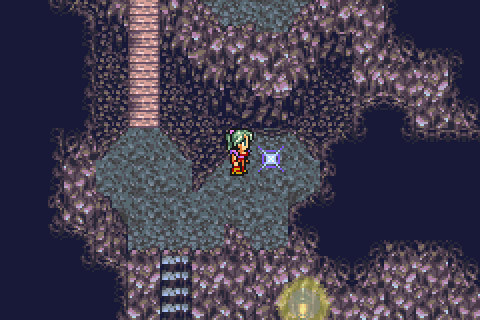 Aeris tries to run further in, but that path is cut off as well. 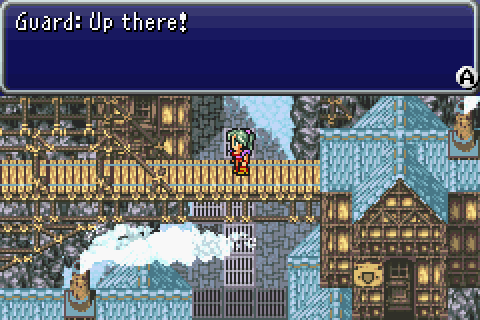 ...that's a lot of abuse even for a protagonist, and she falls over again and blacks out. 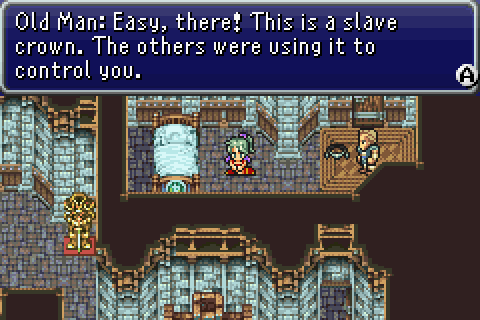 With this slave crown, you'll be all mine! There is a flash of red as he puts it on Aeris' head. Apparently, he finds it very amusing. 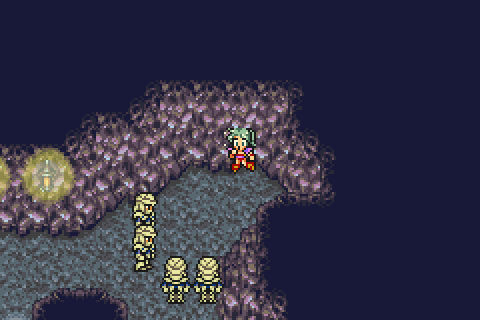 If you learn anything from this flashback, it should be that Kefka is not a very nice man. 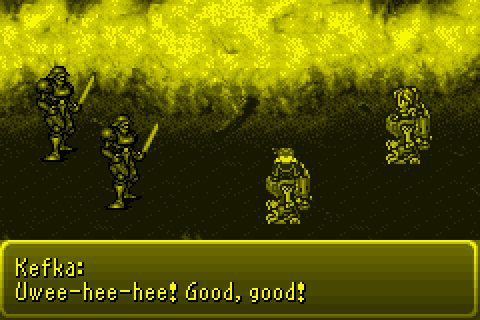 He tests his new toy by having her murder a bunch of his own men. Burn them all to a crisp! Not funny, you jerk. Those men had families! The fact that he finds that even more hilarious should tell you everything you need to know about this guy. This is the fortress we caught a glimpse of in the very first few seconds of the game. It should come as no surprise that we'll be coming here later on, though the hows, whys and whatnots are firmly within spoiler territory. 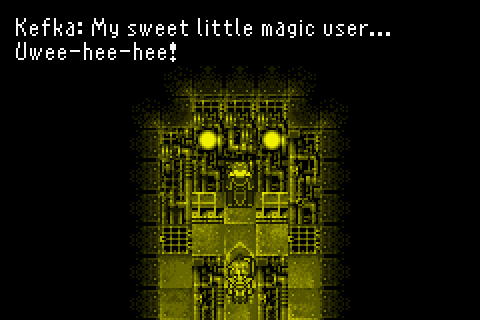 The lost power of magic has returned to us! We are the chosen ones! The time has come for us to claim our rightful dominion over the world! Nothing shall stand in our way! ...the imperial storm troopers eat up every word out of Der Führer's mouth. They're really laying it on a bit thick. 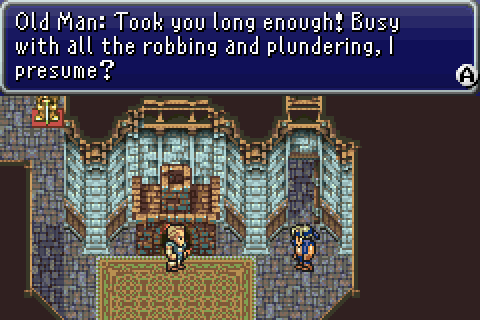 ...and then to the old man who is curiously alive after helping the enemy officer escape. 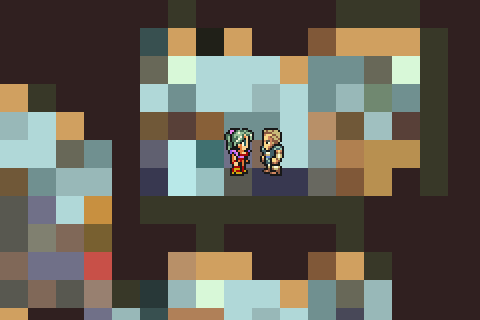 He's joined by someone with a unique sprite, and that along with the job description... 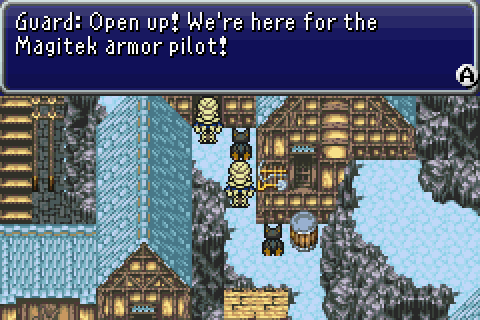 I'll just come out and say it: he's an RPG character. He is shocked. Shocked and appalled, sir, at this vile accusation! He also needs a name. I've already come up with one, so I'll leave this one to you. 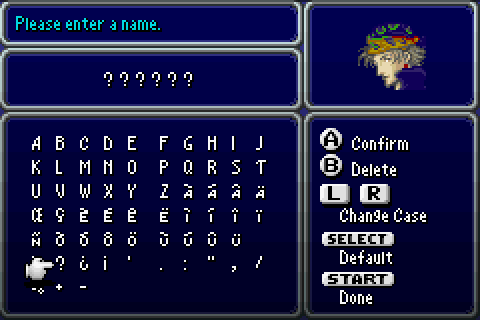 Remember: six characters, and I want something that at least looks like someone might be able to pronounce it.